Doing business in Bhutan has become easier compared to past years. 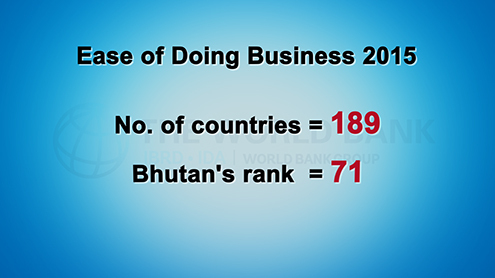 The World Bank’s ease of doing business report, ranked Bhutan 71 out of 189 countries worldwide. Bhutan emerged the highest ranked country in South Asia. Compared to 2014, Bhutan moved up 54 notches. Bhutan instituted two major reforms that helped push the ranking. Bhutan made it easier for entrepreneurs in getting electricity. Transferring property was also streamlined decreasing the time to complete a transfer by 15 days. In getting electricity, Bhutan is now ahead of countries like France as it takes only 61 days to get electricity. A news release from the World Bank states, efforts to improve the business climate in Bhutan accelerated in recent years. World Bank’s country representative for Bhutan Genevieve Boyreau said, in recent years, Bhutan has improved in its regulatory environment and making it more business friendly. This, she said could stimulate both entrepreneurship and job creation in the country. The doing business report measures the country’s business climate through indicators such as dealing with construction permits, getting electricity, enforcing contracts, registering property and trading across borders among others.